I’m pleased to report that Jordan Peele has not pitched headfirst into a sophomore slump and that “Us” is, in many ways, even more get-under-your-skin-and-into-your-nightmares creepy/funny/scary than “Get Out.” I’m also duty-bound to note that the cultural metaphors are quite a bit fuzzier this time out and that the ending is a tangled ball of Huh? You may be too busy screaming to care. Also — and this is a big one — “Us” does us all a great service by handing Lupita Nyong’o a genuine starring role instead of using this talented, beautiful, Oscar-winning actress as secondary exotica or a supporting strut. In fact, Nyong’o delivers impressively not once but twice. But everyone gets to play a double game in this doppelganger shriek-a-thon. 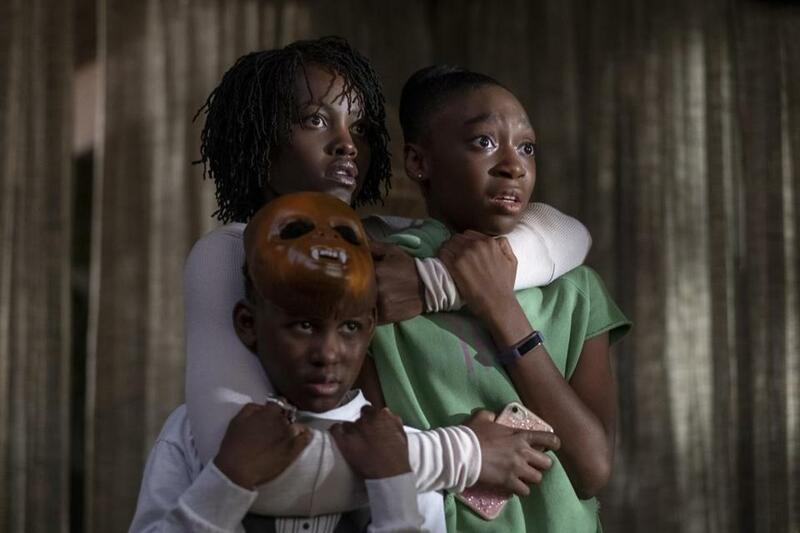 Peele opens the movie with a flashback that almost plays as an urban legend: A little girl (Madison Curry) wanders away from her parents at a beachside fairground and into a deserted haunted-house ride whose sign reads “Find Yourself.” She does, and then some. Cut to the present day and the girl has grown into Addy Wilson (Nyong’o), the confident, capable wife of Gabe (Winston Duke, the scene-stealing M’baku of “Black Panther”) and mother to snippy teenage daughter Zora (Shahadi Wright Joseph) and oddball son Jason (Evan Alex). Underneath, though, Addy’s still a traumatized wreck waiting for the other shoe to drop. Peele gives her enough shoes to stock a Payless. The night after arriving at their vacation cabin — not too far from that same beach — the family looks out the window and sees four silhouetted figures standing eerily still at the end of the driveway. “They’re us,” says the son, and then the games begin. “Us” reveals Peele to be an intuitive master at the trickier-than-you-think job of creating and maintaining atmosphere. A handful of eek-eek-eek scenes aside, the movie’s not so much gory as intensely unnerving, with just enough laughs larded in to remind us we’re having a good time. After a terrifying home invasion by us/them, the matriarch of this other family, a hollow-eyed spectre also played by Nyong’o, tells the trapped Wilsons, “Once upon a time there was a little girl, and the little girl had a Shadow. . . .” Her voice has the whispered croak of a being that has waited eons to speak. I’m getting the heebie-jeebies all over again just typing this. Much of the film consists of hair-raising, tightly choreographed fight-or-flight scenarios, with each family member contending with his or her own doppelganger. Gabe’s is a hulk with a baseball bat, Zora’s can run as fast and to stranger places, and Jason’s is a skittering little firebug in an asbestos mask. We learn there are more Shadows, maybe a lot more, all clad in identical red coveralls, all carrying nasty-looking vintage upholstery shears. (You’d think someone would have noticed the bulk purchases on Amazon.) And it becomes increasingly clear that they’re furiously resentful of us — their mirror images — for everything they lack and we take for granted. If there’s an allegory here, it’s hardly as clear as the caustic racial critique of “Get Out.” Who are the Shadow People? Are they a black underclass left behind by middle-class strivers looking out only for themselves? It turns out there are white Shadow People, too, so maybe Peele’s envisioning a metaphor for a larger army of societal have-nots erupting from below. Or perhaps it’s the director’s take on the seething half of the country that feels pushed down and ignored. “Who are you?” someone asks Addy’s double. “We’re Americans,” she hisses back. Or maybe Jordan Peele just wants to scare our socks off. On that level, “Us” functions with almost unholy filmmaking confidence and fresh thinking; it’s of a piece with “Get Out,” sure, but also with recent releases like “Hereditary,” “A Quiet Place,” and “Annihilation” — mainstream horror movies done with intelligence, forethought, and flair. Not to mention committed performances from gifted actors. It’s too early for awards talk, but what Nyong’o does here is remarkable, conveying the terrified, resourceful normality of the film’s central figure and the staring, husk-like anger of her evil twin. (The strength of the performance is that they’re both the same woman, yet not.) Peele provides acidulous comic relief in the form of Addy and Gabe’s friends Josh and Kitty (Tim Heidecker and Elisabeth Moss), inviting us to laugh at their jaded complacency (and their shrewish twin daughters, played by Cali and Noelle Sheldon) and then pulling the rug out from under us with cathartic shock. For all the skill on display — and notwithstanding that “Us” is an armrest-shredder that’s still great fun — Peele muffs the ending. The script starts explaining things, which only raises further questions that should be explained but aren’t, and the final showdown is choppy and confusing, if satisfying on an emotional level. And the final twist — well, I just can’t, and you may not, either, not when it forces you to mentally recalculate everything you’ve just seen and still come up short. So he doesn’t stick the landing. Most of the rest of “Us” is flawlessly executed, and if it doesn’t resonate as strongly as “Get Out” as a cultural document, it’ll last as a mighty fine scare, a terrific crowd experience, and the work of a filmmaker who’s still just getting started. And in his sneaky yet deadly serious fashion, Peele may be asking us to wonder: At what point in fighting our own Shadows do we become them? What if we already are? Written and directed by Jordan Peele. Starring Lupita Nyong’o, Winston Duke, Shahadi Wright Joseph, Evan Alex, Elisabeth Moss. At Boston theaters, Coolidge Corner, suburbs. 121 minutes. R (violence/terror and language).